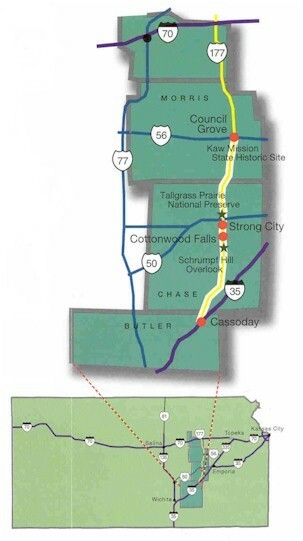 The Flint Hills Scenic Byway goes from Council Grove to Cassoday, Kansas on highway 177. As traveling down the highway tune into 1680 AM radio to hear the history of the Flint Hill prairie. Make sure to stop and read the informational kiosk located in Strong City Caboose Park and Cottonwood Falls Bates Grove Park next to the Cottonwood Falls river walking trail and bridge. Five mile south of Cottonwood Falls is the scenic overlook. It is a great place to view the hills and take in the native foliage.